Spray a small non-stick skillet with cooking spray. Crack one egg on the counter, breaking it gently into a small prep dish. Take care not to break the yolk. Gently slip egg into hot pan and immediately reduce heat to medium. Continue cooking for two minutes, or until egg white turns opaque and there is no clear egg white remaining. If necessary, cover pan for a minute to help cook the egg. Remove pan from heat. Gently slip a spatula around the edges of the egg to make sure it is free of the pan, then tilt the pan and carefully slip the egg onto a waiting plate. Take care not to break the loose egg yolk. Use a larger skillet if you want to cook more than one egg at a time. Placing too many eggs together will make the egg whites thicker, which will take longer to cook, so allow enough room for each egg to spread out. Because eggs cooked sunny side up are not cooked through, it is best to use pasteurized eggs. You can find pasteurized eggs in the egg aisle of your grocery store. 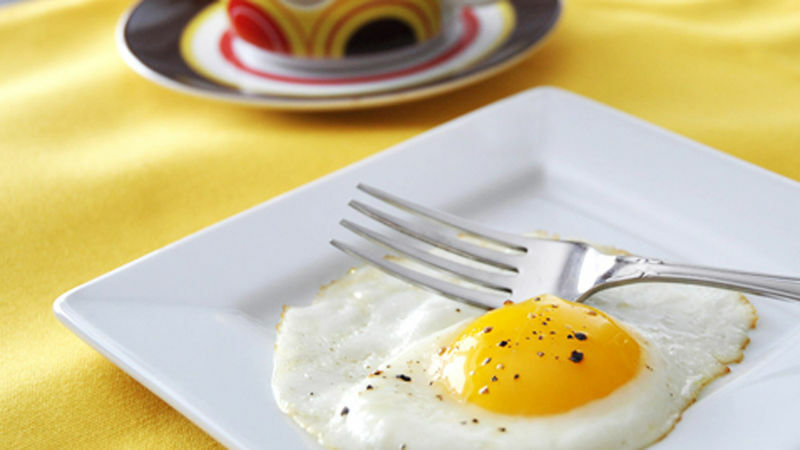 A good non-stick pan may be the most important "ingredient" for making sunny-side-up eggs. You can also use a well seasoned cast-iron pan or a sturdy skillet – the key to making these eggs look good is that they easily slide out of the pan, without tearing the yolk, when you're done. Heat the skillet on medium heat. Don’t let the pan get so hot that it scorches the eggs the minute they hit the pan. This is a sure-fire way to get unevenly cooked eggs, so bring the heat up relatively slowly. If you like, add a little butter both for flavor and to further help the eggs from sticking to the pan. Crack the egg on the counter, not on the side of the pan. This prevents any wayward eggshell from getting into your pan. You don't need to get fancy and make a big display of cracking them, just open the shell up over the pan and allow the egg to drop gently into the heat. How to Keep Eggs from Sticking to the PanTake a spatula and work around the edges of the egg to prevent the white from sticking to the pan. Keep an eye on the heat and make sure the egg doesn’t start cooking any harder than a gentle simmer. You can season them now or after they’re plated. Watch for the egg white to turn a solid opaque color. No clear liquid should be visible anywhere on the egg. If the outside edges are thoroughly cooked, but the inside still needs a minute, you can speed up the process by covering the pan with a lid, steaming the egg just a little. Do not try to scoop the eggs out with a spatula as you risk breaking the yolks in the process, ruining all of your work. Instead, grab the pan and tilt it just slightly over the plate you are serving on, letting the egg slide gently out on its own and on to the plate. If you have an excellent pan or have used enough butter or nonstick spray, they should come out without any resistance at all. Season to taste and you’re all done! Boiling Eggs 101 How Do You Make Scrambled Eggs? How Do I Make an Omelette?